The initial response to this cat in my original article in Multihull International has been excellent. This boat is built with the same high tech concepts as my best racing designs, many new techniques were developed to speed up the building process. 15 years on from when this boat was first launched, several have been built and a number have made ocean crossings. We are all very excited by the performance. She meets all my expectations. Pitching is very well controlled, and the boat trims slightly bow up on a reach as designed. This first boat launched ("Timshel") has a masthead rig three feet shorter than the Tri ( "Damiana") of the same size which we tuned the first boat alongside in the Solent. The two boats were incredibly closely matched on all points. And with the new fractional rig we are confident that the Cat will outsail the Tri on all points including to windward but with more than double the accommodation . The boat is very stiff both lengthwise and in torsion allowing the runners to led out to the hulls. This means that upwind they can be left tightened, and tacking becomes very easy. The boat tacks in its own length without backing any sails. 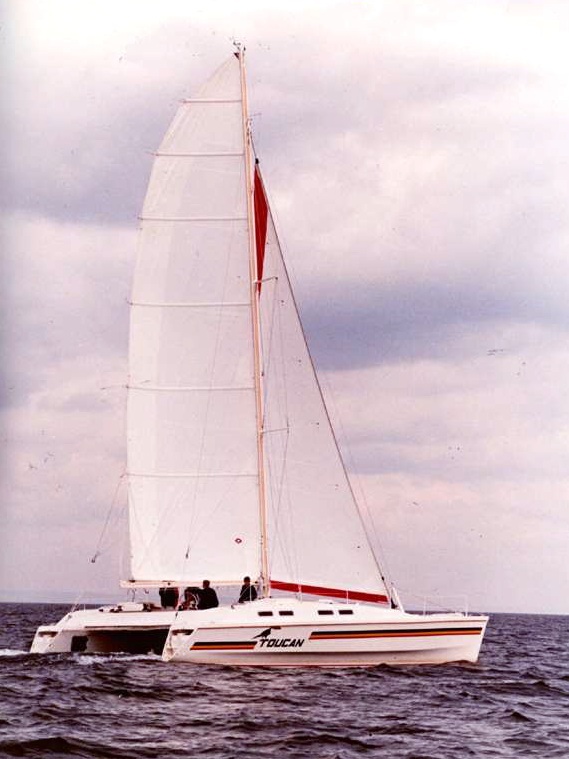 Headsail sheeting angle is seven degrees allowing the boat to point as high as a Tri, and to tack through 85 degrees. She sails very fast with virtually no wake at any speed, making her difficult to photograph because it always looks as if she is not moving. In this photograph she is doing about 13 knots. Also she does not depress the downwind hull as deepiy into the water as I would have expected due to the dynamic lift of the forward sections of the hull. I have therefore increased the load carrying capacity. In the photograph she is sailing at 3.5 tons all up, and she could be loaded to 5.5 tons safely. This dynamic lift also increases top speed due to the the reduction in wetted surface drag. The drawing shows the fractional rigged version. The boat is offered with a mast head rig as an option. Note also that the styling has been changed and there are now permanent cockpit seats in the forward cockpit. So far the boat more than meets up to all my expectations. She is light on the helm, well balanced, and tacks easily (almost in her own length) without having to back any sails. She exceeds the wind speed in 3 to 5 knots of wind, and top speed to date is 23 knots. The boat will sail steadily at 18 to 20 knots with no fuss. In fact the general impression by all who sail on her is the apparent effortlessness required to sail the boat. She goes to windward very well with atop speed hard on the wind of around 12 knots. The race off against the 42 ft Tri "Damiana" has proved to be very interesting. The two boats are incredibly closely matched. I have the feeling that the cat has the slightest edge on a reach, and the tri the edge upwind. It does seem to come down to sail trim and who is on the helm. Sailing up the Solent towards Yarmouth in a force three the tri was about 25 yards to windward and slightly behind after about five tacks, and four miles. So they are really close. 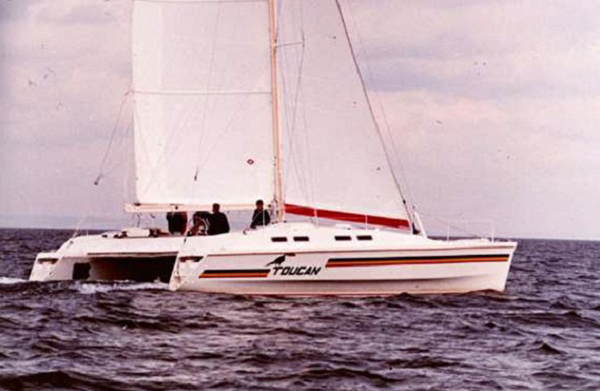 I was on the cat myself and I thought that if I could have been able been able to tension the forestay with an hydraulic backstay, we could have made that extra degree or half degree edge that the tri seems to have. Also I think that the boards could be larger. Raise one board and the speed picks up with slight increase in leeway. It seems that if you use two boards at once, the leeway is the same as the tri but the boat is slower. This has been bourne out by tank testing. We found that one large board was better than two. Therefore on all boats after the first one the daggerboards were increased in size. We have also designed a successful kick up system for the daggerboard. In these trials the cat had three feet less height on the mast than the Tri.. 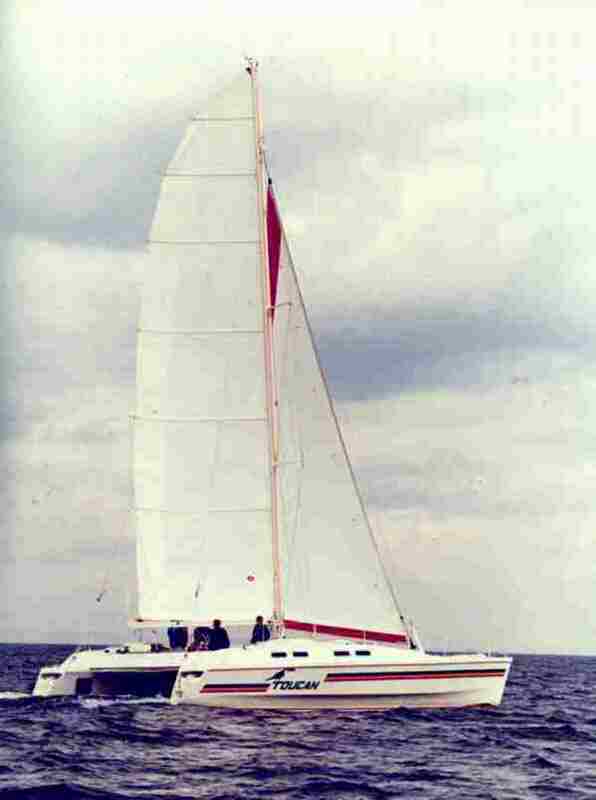 Thus with the fractional rig, or a wing mast and the larger boards, the cat will be faster than the 42ft. tri. so it seems that this design has broken the barrier! It is strange to see the two boats sailing together, the tri heeling and making spray and wake, and the cat level at exactly the same speed. Yet the cat has more than twice the accommodation of the tri. This cat is built using exactly the same structural techniques and materials as my racing designs. However all the factors of safety have been increased with a view to achieving extended life for the boat so that it will remain an excellent investment for the owner. This has meant that 15 years on the boats are holding their value changing hands for more than they cost originally. Similar principles to integrated structure are used in modern sail design, and can easily be seen in the latest sails built for racing boats where Cavalier and Mylar cloths are orientated along the lines of stress, and cloth weights are varied throughout the sail. the stress distribution calculations are often performed on a computer. In exactly the same way, using woven cloths of glass, Kevlar, and Carbon Fibre, and with the aid of a computer, the laminate throughout the boat is varied to achieve the optimum strength and fibre orientation to resist the loads at any given point. High stress points are patched with unidirectional fibres that lead out into the lighter body of the boat in such a way that there is no stress concentration at any point in the transition from high load to low load areas. In a sail this is like reinforcing the clew, head and tack, or the reef points, with patches that distribute the load into the body of the sail. If the structure of the boat is carefully analysed in this way, and also from the point of panel stiffness, fantastic savings in weight can be made with significant increases in strength and stiffness. Furthermore if the shape of the hull is skilfully utilised as well, further gains can be made. The net result is that you end up with a boat that is built like an aeroplane with each component carefully designed for stress, strain and fatigue. Fatigue is very important in any structure that is to be repeatedly cycled (like an aeroplane or a multihull) during the course of its life span. In many instances the fatigue stress levels determine the amount of material used at certain points in the structure, rather than ultimate strength or stiffness. 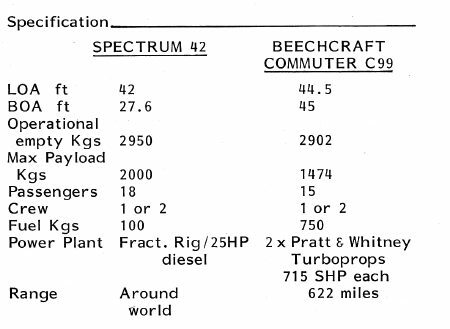 By computerising all aspect of the engineering design of the boat these allowable stress strain or fatigue levels can easily be adjusted to suit the type of boat being designed. Of course in a cruiser racer of this type the levels are all much higher than in an out and out racer. However we are fortunate to have the on-going, dynamic, full size test bed of the racing circuit to study. And more importantly boats like Brittany Ferries GB, Travacrest Seaway and Fleury Michon VI, who between them have raced and been sailed a total of 20 times across the Atlantic, and also on record breaking voyages around Cape Horn, and which have never yet suffered any structural failure whatsoever. In order to realise the potential of the design, new production techniques have had to be developed. Careful consideration has had to be given to the quality of all the materials used to build the boat. this has meant the best Isophthalic Polyester Resin was used on the outside skin of the hull and in the crossbeams, both for greater strength and water resistance. The resins were post cured to obtain the optimum resin/fibre matrix properties. Cavalier is used throughout the hulls on the inner skin in combination with E Glass woven cloth in a triaxial configuration for maximum impact strength and stiffness. To give that extra resilience to the bottom of the hull the glass is doubled and the kevlar linked through to the outer skin in a strip one foot wide along the keel. different types of foam are used in the hull bottom, topsides and decks. Airex on the hull bottom for maximum impact resistance and Divinycell for tolerance to high temperature in the decks. Apart from the structure of the boat, the one area where a large amount of unnecessary weight is added to a cruising boat is in all the interior bulkheads and furniture. 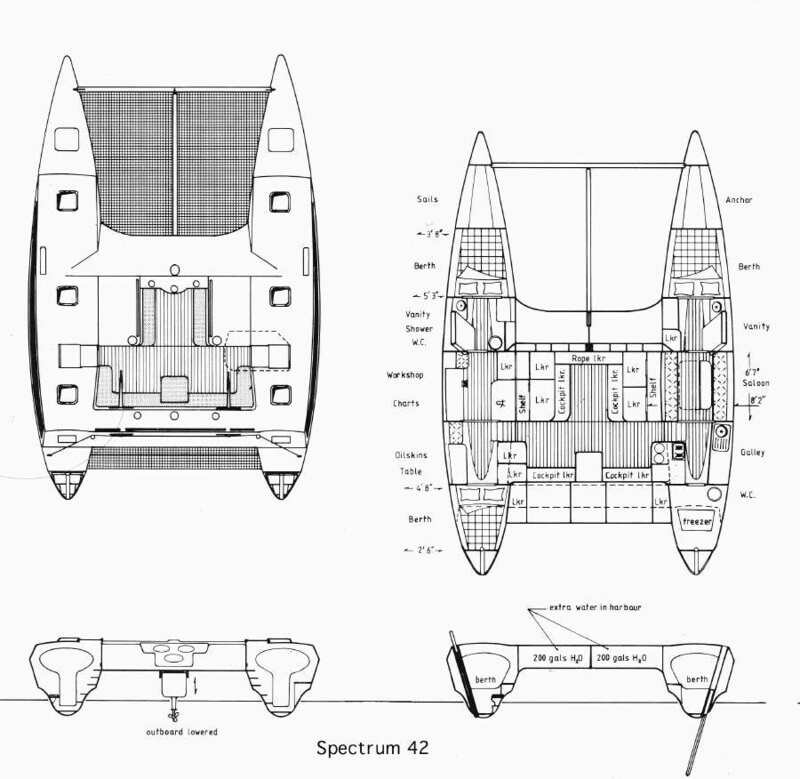 In the Spectrum 42 every interior component has been specially made from light sandwich panels. Once again exactly as in modern passenger airliners. To achieve ultimate stiffness and light weight in the wide main cross beam, carbon fibres are led across the full width of the boat and down into each hull, fanning out into specially reinforced areas in the body of the boat. The remaining fibres in the beam are laid in carefully determined directions to resist both twisting and bending. 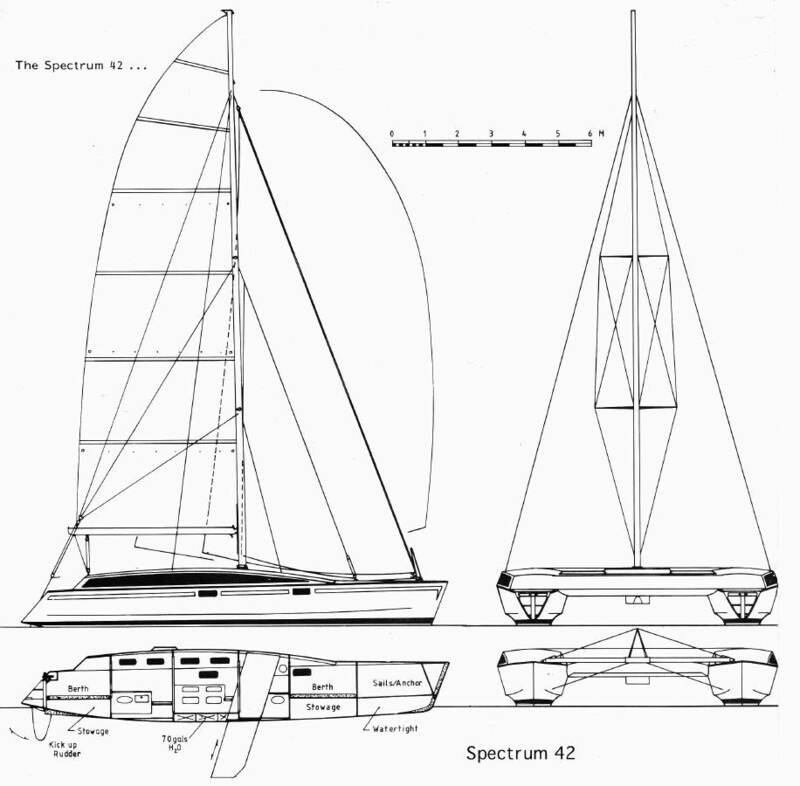 At no point in the design or building of this boat has any compromise been made to simplify the design or suit the production process if the change was considered to impair seakeeping ability or performance. Instead the accent has been to find new production techniques and to set a standard for the future. Rather than modify the design to the production we developed the production to the design. The net result of this painstaking design, engineering and building approach is that we have produced a boat that is probably 30% lighter than any other equivalent sized production multihull, and yet has comfortable living accommodation with no sacrifice to sailing and seakeeping qualities. The wide beam gives tremendous security when the family are on board and yet allows you to power up to over 20 knots when the mood takes you. Take down the the sails in a storm, and you are on a wide raft - the time when you will be happy that your boat is nearly twice the width of the previous generation of production multihulls. In the absence of any comparable multihull on the market, and all the talk about aircraft technology.... the table shows how we stack up against the competition.